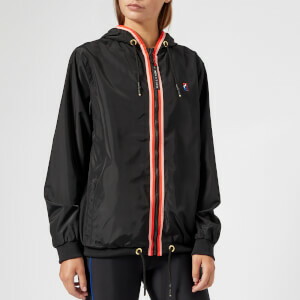 Designed with retro, shell suit-inspired characteristics, the women’s ‘Ruck’ jacket from Australia’s ultimate luxe athleisure label, P.E Nation arrives in a white colourway, offset with colour-contrast inserts at the front and along the sleeves. Zipped up at the front, ‘The Ruck’ features a shirred collar that extends into a drawstring hood, long raglan sleeves and elasticated trims at the cuffs and hem. Side welt pockets and an embroidered P.E Nation logo on the chest complete the design.